The current policy is too brief, vague and too easily open to misinterpretation. CILIP should state in the policy that it is against job substitution of any library staff. Job substitution featured so heavily in the recent volunteer policy review document that it warrants a clear statement indicating that CILIP is against this. It currently leaves the door open for library service providers to interpret the policy in a way that wasn’t originally intended, go against the spirit of it and avoid fulfilling statutory duties and requirements for a comprehensive and efficient library service. The written policy may be the first time people come across CILIP’s Volunteer Policy and, as such, it needs to clearly indicate CILIP’s stance. The responses I received and read from CILIP Council representatives (including Mark Taylor, John Dolan and Phil Bradley) emphasised that CILIP does advocate for the profession, but this isn’t emphasised enough in the policy. This was also reflected in the discussion by others surrounding this correspondence. CILIP advocacy role needs to be backed up by the written word in this policy, as much as the policy needs to be back up by action from CILIP. The length of discussion surrounding the policy (indicated above) serves to highlight that the written policy is currently ambiguous. In highlighting the use of volunteers the policy needs to emphasise the critical need for professional/paid staff even more. It was a positive discussion and encouraging to hear so many members of CILIP Council agreeing with the points above. It did raise questions about how the policy could be enforced and what would happen if employers or members went against the policy? Would the ethics board be called upon? How would members be expected to respond if they were asked to act against the spirit of the policy? This is obviously important, but in my mind, if you haven’t got a strong policy in the first place you won’t have anything to defend anyway. I also understand that changing the wording of the policy won’t automatically make local authorities turn around and re-staff libraries. However, what I hope it will do at least is re-inforce the idea that the actions some library service providers are currently taking with regard to volunteers is unacceptable to CILIP and its members, and may in future stop others from going down this route. CILIP is one of the few high profile organisations that has the capability to influence national policy on libraries, and as such, its policies need to be strong. The discussion also highlighted that concerns over volunteer policy isn’t just limited to public libraries or even in the UK, even though this is the area generating the most discussion. It’s a concern in other sectors and countries too. The strengthening of this policy should also help these sectors. So, that was the discussion (what I can remember of it, anyway) and the aim now is for CILIP to review the policy over the next few weeks. By the end of July it’s hoped that the revised version will be in place and CILIP will present something that can be used to empower its members. Yesterday was National Libraries Day in the UK – a celebration of libraries – not just public, but also academic, specialist, business, health, schools, etc… all libraries! I was hoping to celebrate in the week building up to today by taking part in my own librarithon – ie visit as many different interesting libraries as possible. This was inspired by Zoe Toft who, along with her children, took part in her own charity librarithon last year. In the end, due to the fact that I had to complete a major project in work and had a major meeting to prepare for and attend, the librarithon didn’t happen. 😦 Oh well! Instead I took part in a mini-librarithon today in London with a couple of other librarians – @usernametaken10 and @misshelved – who fancied exploring a few new places. The aim wasn’t to take in as many libraries as possible just for the sake of visiting them. We decided to visit the Dickens & the Supernatural exhibition at The British Library, two new libraries in Dalston and Canada Water and an ‘Idea store’ in Whitechapel, which was running an author event. As we were in London, and as it’s a national library, The British Library seemed like a really good place to start. I’ve visited this library a few times. Every time I’ve been there it’s to visit an exhibition. Exhibitions in a library are a great way to provide focus on information/resources held by the library that might have otherwise been hidden away – hidden away in terms of location, and in Dickens case, hidden away in his body of work. He’s probably more widely known for fiction that touches on social history, rather than the supernatural. Exhibitions such as this get potential readers thinking about the author in a different way. It was quite a small exhibition – took us about 20 minutes to look at it – but it was interesting to find out about how his early childhood and the people in it influenced him. He was sceptical about ghosts and the paranormal, but that didn’t stop him from writing classic ghost stories, such as The Signalman. 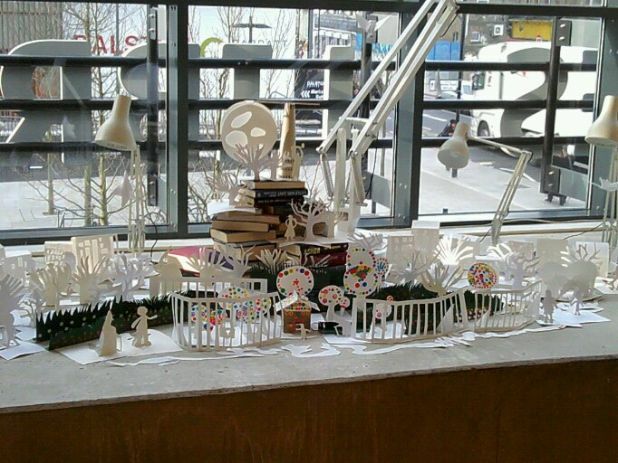 Then we took the train to Canada Water Library. Again, this is another brand new library and has great views overlooking Canada Water itself. The building itself is pretty funky – as @misshelved said, on the outside it looks like a Jawa Sand crawler. 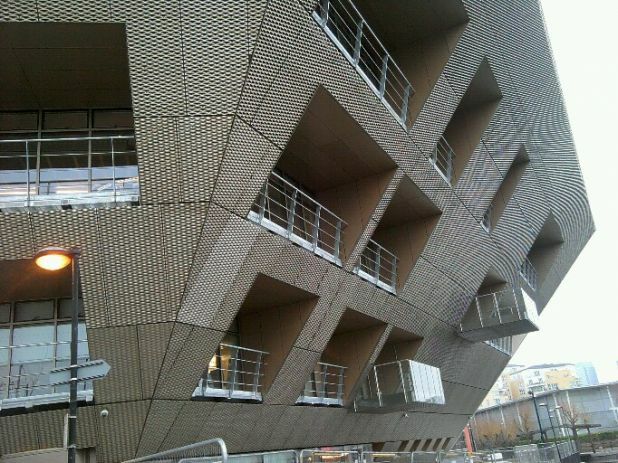 Canada Water Library or Jawa Sand Crawler? Inside the library there’s a coffee shop and quick choice section (like Dalston Library’s foyer). A set of stairs in the centre of the ground floor leads up to the main part of the library, housing the children’s library, computers and fiction. Up another set of stairs is the non-fiction section on a balcony area that over looks the rest of the library. It goes all the way around the library and up here they also have study spaces and meeting rooms. I’m not sure whether “a day in the life” of the library as shown here is actually how it is, but I could imagine spending a couple of hours a week in there just relaxing and browsing/thinking if I lived closer to it – it’s got a pretty relaxed positive feel to it. Finally, @usernametaken10 and I headed to Whitechapel and visited the Idea Store there. It’s a few years old and is based over a number of floors (4, I think). Our aim was to go to a free author event (Austerity Writes Back) which was on for an hour and a half. We only managed to catch the end of the event (last 20 minutes or so), but what I saw/heard was really interesting, especially as some of its focus was the austerity cuts and protest. That’s sort of why National Libraries Day exists (on the back of Save Our Libraries protest day last year) and is also relevant to Voices For The Library activities. One of the authors (and publisher) Bobby Nayyar made a comment that made sense to me about the current state of affairs with the economy. It was along the lines that there’s nothing wrong with businesses making a profit, but some businesses seem focused on making an obscene amount of profit and do not understand the social impact this may have on the world around them. 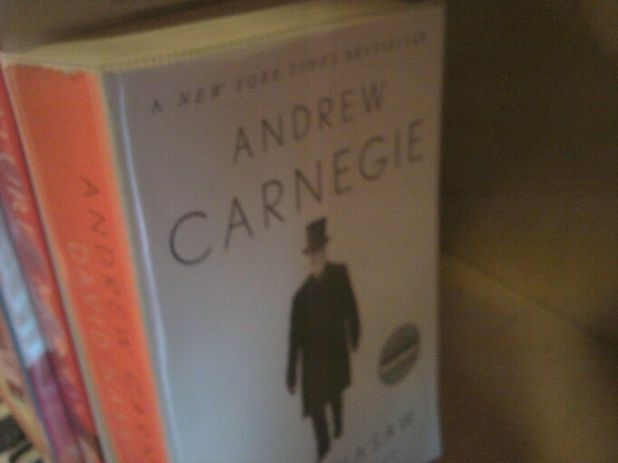 I also want to mention that while I was mooching around the Idea Store I spotted on the end of a shelf a biography of Andrew Carnegie. It made me smile to think that, as a philanthropist who funded so many libraries, he has a lot to be thanked for on National Libraries Day. I wonder how Andrew Carnegie would have felt today about library cuts? I really enjoyed today’s little adventure as part of National Libraries Day. On top of visiting a handful of libraries (old and new), I had a laugh and mulled over a few library related ideas with @usernametaken10 and @misshelved. I also got to explore parts of London I’ve never been to before, and I listened to a few authors talk about their books and how they were inspired. Campaigners launch £1m Chalk Farm library plea | News. Campaigners are trying to raise £1,000,000 to secure the long-term future of their community library. When I read this article in The London Evening Standard my mouth just dropped open in disbelief. It’s wrong that Camden Council have forced campaigners into this situation, just so they can use a service they should automatically be receiving from the local council in their area. I know Camden haven’t said to them, “Go out and raise £1m and we’ll give you the library,” but if campaigners feel they have to raise this sort of money to keep it running, then they have basically been forced into it. Is it even possible to raise that amount of money in a local appeal, even if you live in a wealthy area? …and just imagine if every volunteer run library throughout the country had to raise that amount of money to provide a long-term local library service in their area? How many millions of pounds would that be? It’s seems particularly ironic that local Council’s are saying they have to save money on library services because they aren’t allowed to increase Council Tax by a significant amount, and yet, some local communities may end up paying more by contributing to this sort of fundraising appeal. This post was written as part of the “Library Day In The Life” project. In my day job I’m a Technical Librarian for a public library service in the UK. This mainly involves looking after the catalogue (I don’t tend to do much cataloguing these days, as that’s the responsibility of my assistant) and investigating possible uses of Web2.0 and Library2.0 services. I also wear another hat, as I’m a member of the Voices For The Library (VFTL) national campaign group, which was formed almost a year ago to address concerns about severe cuts local council’s were making to library services. 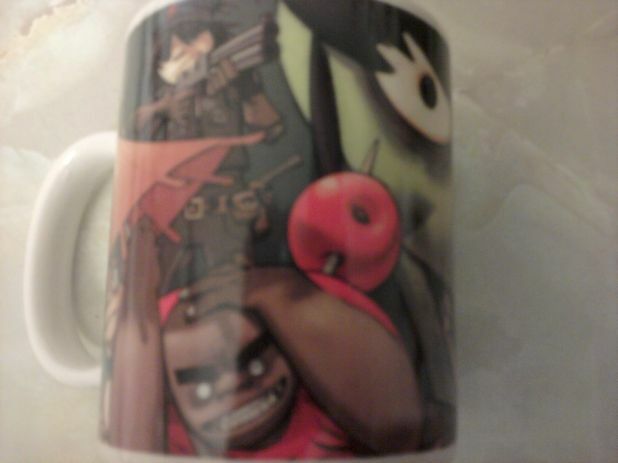 The Gorillaz coffee mug that contains the coffee that keeps me going in work! I had the morning off, so during this time I responded to a few emails from fellow campaigners in Voices For The Library team. Following this I did a bit of tweeting for the Voices twitter account (@ukpling). Generally I do this a couple of times a day. I use Google News UK to identify relevant articles for tweeting and I also look for items to retweet from other library campaigners. Got to work and checked my emails. Briefly discussed forthcoming meeting with cataloguer about the use of Interest Categories on our stock. Surrey has used Interest Categories in conjunction with Dewey classification over the past 20+ years and we are looking at how we can improve on them. The meeting will also involve members of the stock team. I also caught up with emails about our e-book service and the area in general. I was part of the original project group that helped set the e-book service up, from the cataloguing perspective. My initial involvement was limited, but it looks like I’ll be having more involvement in this project in the future. I subscribe to a number of email lists for libraries and had a quick scan through the emails they generate. One discussion thread relevant to my role was the “Digital Economy Act”. Had a quick look at the new version of Whichbook.net, to investigate if we can make use of it in some way. Maybe its ability to share with Facebook would be useful in some way? I really like the way you search using this catalogue. Always gives me something new to read when I’ve tried it in the past. Caught up on some Voices For The Library discussions when I got home. Another morning off again. Sent out a few news tweets for Voices For The Library/@ukpling. Picked up copy of “Surrey Downs” magazine on the way out of the flat. It included an article about plans for Surrey Library Service. Went to lobby outside County Hall about changes to library services. About 80 campaigners were in attendance. Unfortunately I could only stay for about 40 minutes. Went to meeting about the styling/configuration of our new public catalogue. Following this I went to the local library to finish typing up minutes for a meeting I’d attended on the previous Friday with colleagues who manage the stock and coordinate events and promotions. 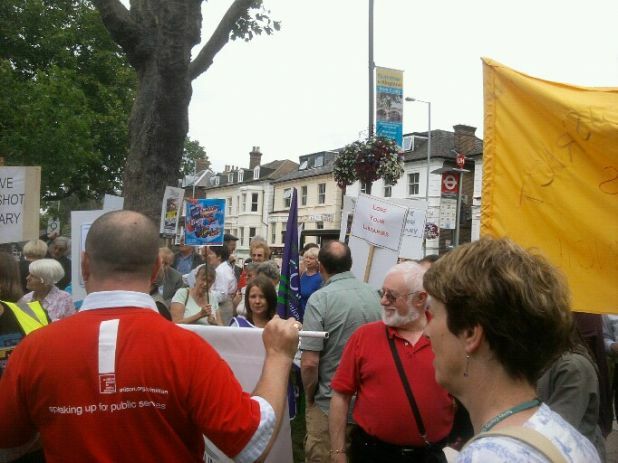 Got home and wrote an update for my blog about the situation in Surrey Libraries. I also caught up with a few VFTL discussions. I worked on creating a paper.li newspaper for my public library service. Paper.li is a link aggregator that produces a page of related items either daily or weekly. I’ve created paper.li’s for other topics eg. Save libraries and charities. I just find it a useful way of presenting articles, blog posts, photos, videos etc that have been tweeted around a specific theme. It saves people trawling back through a lot of people’s tweets to catch up on the news. I’ll also be running a workshop at some point with my team covering paper.li. I also investigated the intricacies of Google+; why it’s important and how it can be used for current awareness, discussion and work, etc. I’ll also be running a workshop on this with the team. I like Google+, but I’m not sure how it will affect my use of other social network sites. Did a bit of tweeting for VFTL. Mostly checked emails and responded. We currently use Internet Explorer 7 in work, which isn’t compatible with some of the newer whizzier websites. This means I have to download Google Chrome instead to use them. So, I downloaded Google Chrome and took a look at Storify.com. Storify allows you to combine Flickr, Twitter, links, videos, text into a narrative format. My library service ran a Children’s Book Festival earlier this year and I tried to put something together to cover this. Watched a webcast of the Cabinet meeting held on Tuesday, which contained a discussion about the library service. More VFTL tweets and discussions when I get home. 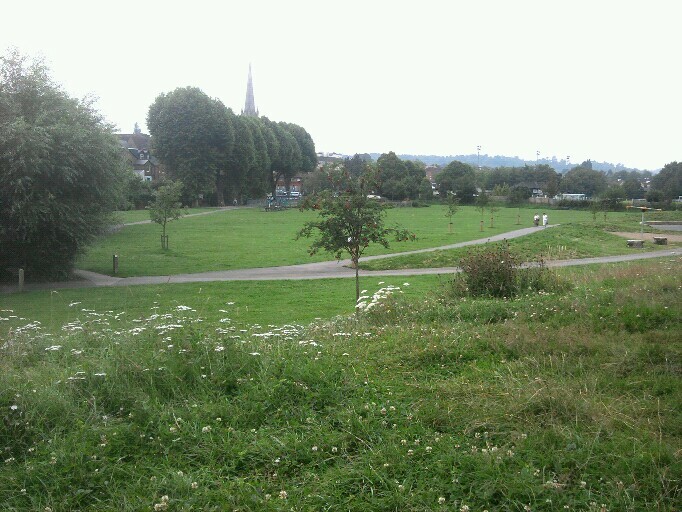 Sat in the park on a lovely sunny morning and put together a VFTL blog post about the new Portsmouth library on my laptop. Checked emails in work and responded to a list discussion from a librarian in another local authority about Library apps. I took the time to read (some of it anyway) and discuss the Localism Bill. I feel I need to play a part in these discussions, not only to know what is going on, but to hopefully influence it in some small way and so I can be prepared for the future and the effects this may have on library services. I booked myself onto CILIP library advocacy event in September. Stumbled across an article about e-libraries on the Conservative Home site and commented on it, highlighting the fact that public library services need to be seen as a whole and physical libraries shouldn’t suffer because e-libraries services are being developed. Had my monthly 1-to-1 with my line manager. In this we discussed how my work was progressing; priorities; plans; projects. Went home and umm…. caught up on a couple of VFTL discussions. The only library related work I’ll probably do over the weekend is a few VFTL tweets and emails… unless anything major happens – which is always a possibility. I’m not insinuating in this question that they aren’t trusted – I believe they are. I believe they’re trusted by people who don’t even use them. I believe that if people thought about what a library could offer them they’d use them more. Maybe the problem is that many people don’t automatically think “Library!” when they should. But why don’t they think like this? Don’t they know what libraries are all about? Is this caused by a lack of marketing? Is it caused by a lack of branding? A brand you can trust… but maybe a brand too many people no longer understand! ?